In To pierce, to puncture, 2017, the skin surface is understood to hold accumulated layers of experience and history, which shape the body and the self. The work deals with the intersection of religion and queerness within the body, and considers how they might transform one another. 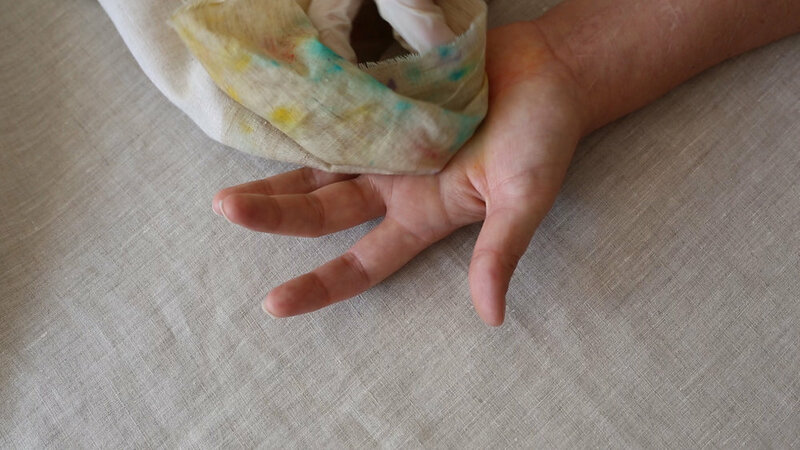 The video shows the artist’s palm being tattooed with a delicate burst of colour - a deconstructed rainbow. Scarred ridges, just visible across the wrist and forearm, are physical reminders of those sedimented histories. Through repeated puncturing and wiping back of the tattoo, binaries of ‘wounding’ and ‘caring’ become blurred. This work recalls a number of religious rituals: the hand is cupped as though to receive communion, washed with water as though being baptised. The tattoo’s location in the palm references stigmata, the crucifixion wounds on Christ’s hands and feet. Significantly for this work, ‘stigmata’ is also the Ancient Greek word for tattoo: its root means ‘to pierce, prick or puncture’. To pierce, to puncture seeks to reclaim both religion and the queer body. Through a deliberate process of re-inscription, the body is transformed; the ritual opens up a space where queerness and religion can co-exist, held together in the palm of the hand.